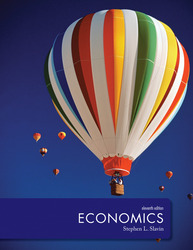 Steve Slavin's lively and comprehensive Economics 11e has a student-friendly, step-by-step approach. As in previous editions, Slavin introduces more math review than other products to help students get past math phobias through consistent practice. The content is set up as a workbook, encouraging students to fill in tables and graphs and work problems as they read to actively engage with the material. Matched with the extensive learning aids available in Connect, including the adaptive study tool LearnSmart, Slavin provides a complete learning environment for the introductory economics student. Mobile Access to Study Tools: Barcodes (QR codes) on the opening page for each chapter provide students with access to PowerPoint presentations, chapter quizzes, and 4-color versions of the graphs in the text, right from their mobile devices. These resources are also available on the Online Learning Center. Current Events Coverage: Our halting recovery from the Great Recession and the fiscal and monetary stimuli that were intended to promote it are discussed and evaluated not just in the fiscal and monetary policy chapters, but throughout the text where appropriate. Important public issues such as the “ 1% and the 99%,” the Internal Revenue Code, our trillion-dollar federal budget deficits, and the fiscal cliff are fully discussed. Several new “Economics in Action” features have been added, (formerly “Current Issues”), including The Internal Revenue Code, Should Millionaires Pay More Taxes, China's Rapid Economic Growth, and The 1% and the 99%. This feature helps make economics more relevant to students by providing a practical application of concepts. Please refer to the Preface for a complete listing. McGraw-Hill LearnSmart: Distinguishing what students know from what they don't, and honing in on concepts they are most likely to forget, LearnSmart continuously adapts to each student's needs by building an individual learning path so students study smarter and retain more knowledge. Reports provide valuable insight to instructors, so precious class time can be spent on higher-level concepts and discussion. Connect Economics: McGraw-Hill's online assignment and assessment tool Connect Economics provides assignable, autogradable versions of end-of-chapter problems in static and algorithmic format, as well as test bank content and graphing problems. Students receive detailed step-by-step feedback on assignments and all assignable content is fully integrated with an eBook. Students are also able to search, highlight,and take notes within the eBook. Connect provides instructors with powerful reporting tools allowing them to plan, track, and analyse student performance across learning outcomes. Keynesian Emphasis: The advent of the Great Recession brought Keynesian Economics back into fashion. Slavin has consistently covered Keynesian analysis more extensively than other principles texts, with full coverage of how Keynesian policy prescriptions were used to fight the Great Recession. Interactive Learning Approach: An integrated workbook allows for immediate reinforcement of ideas without the cost of a separate study guide. As they read, students solve numerical problems, fill in tables, draw graphs, and do economic analysis. Addresses Math & Graph Phobias: Helps students past their math phobias and fear of graphs by having them do hundreds of problems, step-by-step, literally working their way through the book. Review of Math: The review enables all students to start on a level playing field. Extra-help Boxes provide more assistance with the basic concepts and math, which will save valuable class time. Advanced-work Boxes give instructors the option of raising the bar.